Pharma Marketing Blog: Does This Email Message from KVK Tech Violate FDA Regulations? Does This Email Message from KVK Tech Violate FDA Regulations? Today, I received an email message from KVK Tech - a generic drug manufacturer located in my my hometown of Newtown, PA - regarding a gift to Stanford's Department of Bariatric and Minimally Invasive Surgery (see below; ignore that the email has the wrong date on it - you can't expect a drug company to have good copy editors, can you?). 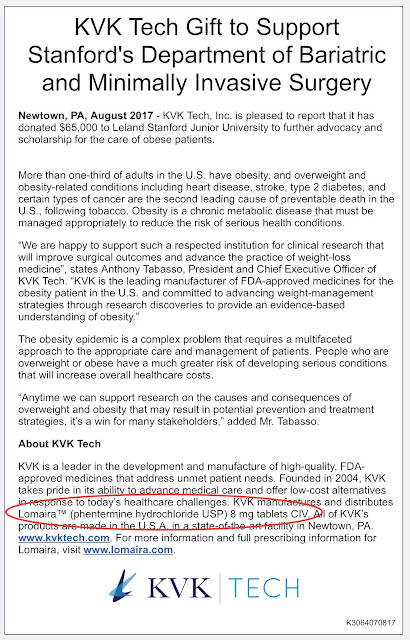 It talks about obesity in the U.S.
At the end of the email, in the "About KVK Tech" section, it mentions that it manufactures and distributes Lomaira, which is a drug to treat obesity. Unfortunately, KVK Tech does not mention the Important Safety Information (ISI) whenever a drug company mention a brand name drug and its indication in the same communication. I believe, therefore, that this email violates FDA regulations. I've passed this on via email to the FDA's BadAd program, which I am not sure still exists. Not being a healthcare professional, I don't have much standing with the FDA in any case. So, what do you think? Violative or not?